Kenneth Andrews is a native of Onondaga County. 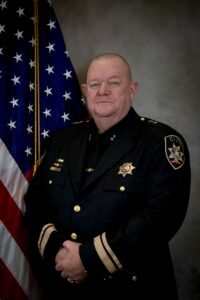 Chief Andrews graduated from Jamesville-DeWitt High School in 1974 and continued his education acquiring an Associates degree in Science from North Country Community College and a Bachelor’s degree in Health Science from Quinnipiac College. Chief Andrews further achieved his Master’s degree in Business Administration in 1991 from Syracuse University. Chief Andrews is the owner and operates K & A Services and Mobile Imaging Ltd., which are portable x-ray companies that provide services to over 100 nursing homes in 20 upstate New York Counties. He serves as the Board Chairman for the National Association of Portable X-ray Providers and has been an active member of National Portable X-ray Leadership for over 30 years. Chief Andrews has served as town councilor for the Town of DeWitt from 1993 to 2015 and was the Chairman of the DeWitt Police Commission from 1999-2014.During his tenure, Chief Andrews has served on the NYMIR Board of Governors since 1996 and has completed a term as the NYMIR President. He has also served as the President of the Executive Committee for the NYS Association of Towns. In addition to serving as an Empire Zone Board member for Onondaga County, Chief Andrews has completed his appointment to serve as a member of the Board of Directors of the ONCENTER Convention Complex for Onondaga County New York. As the Civil Chief of the Onondaga County Sheriff’s Office, Chief Andrews is responsible for the management and supervision of the Civil Process Division, Administrative Division, Information Management Section and the Research and Development Section. Chief Andrews resides in DeWitt, New York with his wife and children. The Mission of the Onondaga County Sheriff’s Office Civil Department is to exercise its responsibilities to professionally receive, serve and execute all civil process and orders that have been issued by a legal authority in a reasonable and timely manner while maintaining an impartial stance between all parties having an interest in a case. THE CIVIL DEPARTMENTS HOURS FROM JULY 1ST THROUGH AUGUST 29TH ARE 8:00 AM – 4:00 PM.